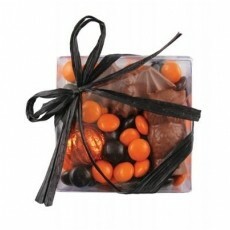 2.75oz orange and black Colorific Chocolate bites, 1 milk chocolate bat, 1 milk chocolate owl and 1 foil wrapped milk chocolate pumpkin. Packaged in clear box and tied with black raffia ribbon. Price includes 4 color label on the box.